Don’t miss this treat! 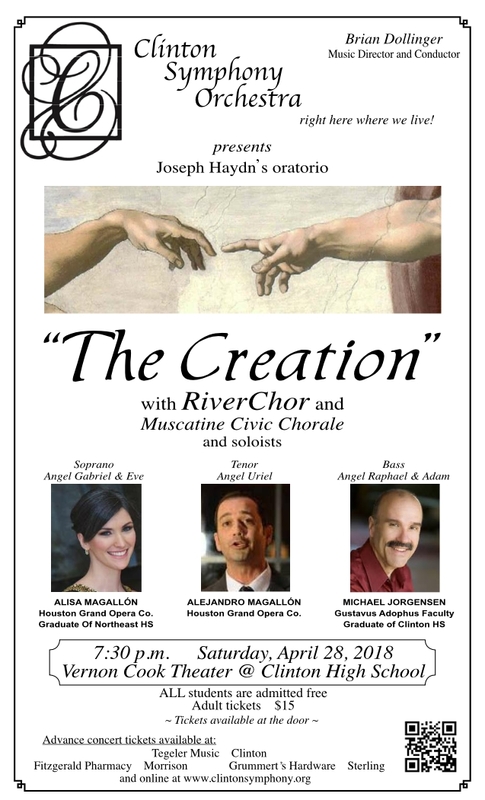 RiverChor will be performing Haydn’s “The Creation” on April 28, at 7:30pm at Clinton High School’s Vernon Cook Theater. The concert is in conjunction with the Clinton Symphony Orchestra, and the Muscatine Civic Chorale will join us, rounding the choir out to about 70. In addition, we welcome special guest soloists, two of which are from the area; Alisa Magallon, graduate of Northeast High School, and Michael Jorgensen, graduate of Clinton High School. The three soloists sparkle on the intricate passages presented by Haydn. RiverChor is excited to present this oratorio in Clinton, we traveled to Muscatine earlier this month to perform the work with the Muscatine Symphony, and it was quite spectacular. We expect it to be even better in Clinton!